Whether you need an exhibition display stand built, a media wall, stage set, retail interiors or a custom display; our T3 modular displays will have you covered. Perhaps the stand out feature of our T3 modular displays is the ability to assemble an entire display without any tools. 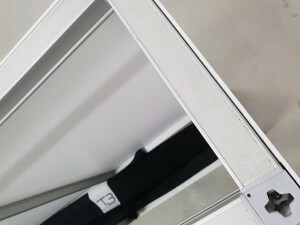 The extrusions (which can be custom cut to any length less than 4m) connect together with a simple twist and lock action – no screws, bolts, locks or levers required. T3 can be used to create an entire free-standing exhibition stand or it can easily fit inside a shell-scheme. The T3 systems are able to take graphics printed on fabric, rollable material such as polypropylene or more rigid material such as composite aluminium and forex pvc. Fabric easily attaches to the system by applying silicon beading to the edge of the fabric and then placing the beading into the slots on the T3 extrusion, which can be seen here. 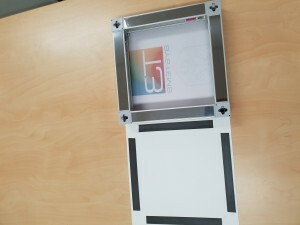 When using rollable or rigid graphics magnet can be used to adhere the panels to the T3 frame as seen below. 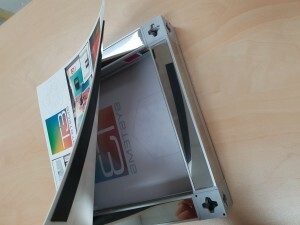 Another amazing feature of the T3 modular display is just how easy it is to reuse and reconfigure. Once you purchase T3 extrusions you are not locked into one particular design, you might need new graphics or skins but the frame can always be used in different ways. A great example of this is a client who had a relatively large custom exhibition display designed, used it for the exhibition and just a few weeks later used it as media wall and counter for a product launch. 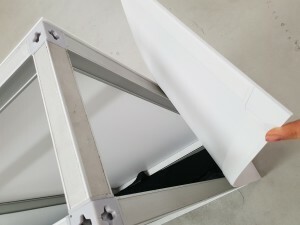 Here is a short video demonstrating the assembly of a lightbox made from T3 extrusion. T3 is lightweight which is great when it comes to transporting and storing, despite being lightweight it is extremely sturdy and can support large monitors, screens and products, even up to 100kg’s. Have an upcoming show, event or product launch? Want some ideas on how to really make an impression? Get in contact with our leading designers today and we will put your brand front and centre of peoples minds.